Setting up your own hypnotherapy business? Here are some quick tips to help you connect with potential clients. If you’re in the hypnotherapy industry, chances are you’re here for a reason – because you have a passion for helping people. This is often the driving force behind any service-driven industry and the reason many of us get up and go to work every day. If you’ve recently gained your qualifications and are in the early days of setting up your own practice, you’re probably raring to go. Before you get started though, there’s one thing you’ll need… clients! People connect with people. So, as much as you may wish to remain a faceless entity, it really helps to put a face to a name. If you’re really not comfortable adding a photo of yourself to your website, add some photos of your workspace. Talk about your story – what drew you to hypnotherapy? How has it impacted your life? You don’t need to go into too much detail if you don’t want to, just a little bit about your journey so far can help clients get a feel for who you are and how you work. Don’t make your clients hunt around your website for your contact information! Make it clear how clients can contact you and provide a couple of options. By phone is standard, but some people are more comfortable emailing in the first instance so it’s helpful to have this as an option. Again, this is all about making life easier for potential clients. Be clear about your working hours, your location and how people can get to you (for example if they have to park elsewhere, give them some guidance). Also, try to be as clear as you can about your fees. We understand that it may differ from client to client, but saying “Contact me for fees” can be a little intimidating and clients may not bother. Instead, look to give a general idea of pricing and mention that these prices may differ depending on circumstances. What are you passionate about? Have you done further training in a specific area? Be sure to shout about this on your website. 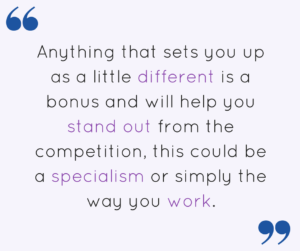 Anything that sets you up as a little different is a bonus and will help you stand out from the competition, this could be a specialism or simply the way you work. Become an authoritative voice on the subject and consider writing articles to share your knowledge. Content like this will keep visitors to your site interested and can help bring them back, time and time again. Keep in mind who your target audience is. Chances are they won’t be too familiar with the therapy world and may feel alienated by terms they don’t understand. Try to write in an easy to understand language on your site and explain any terms your audience may not already know. Out of date websites with broken links are a sure fired way to put clients off. Keep content fresh with a regular review – is there any extra training you’ve completed? Do you have any new case studies you can discuss or testimonials to add? Check your links regularly and if any break, see if you are able to fix them, if not, get in touch with your website provider for support. Have you taken some time to see what other hypnotherapists in your area are offering? If not, this can be a helpful exercise. 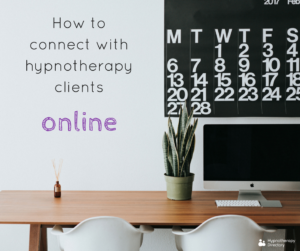 See what differentiates yourself from other hypnotherapists and note any frustrations you feel as a visitor on their site – how can you avoid that? Of course, it’s not all about ‘competition’, you may want to reach out to fellow hypnotherapists to network, discuss business tactics and share ideas! Do you have an online presence? What tips do you have for newly trained hypnotherapists? Let us know in the comments or join the discussion on Facebook!